CATHOLIC GIFT SHOP LTD - Lourdes Blue Heart Shaped Rosary & Lourdes Water Gift Set. 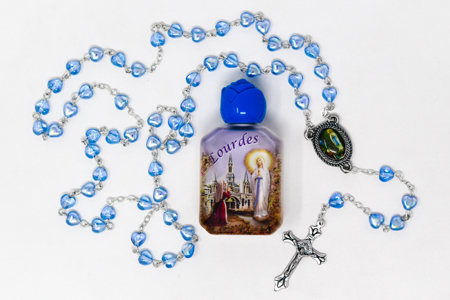 Lourdes Blue Heart Shaped Rosary & Lourdes Water Gift Set. Lourdes heart shaped rosary & Lourdes water gift set. Bottle of Lourdes water with a rose top (design may vary from that pictured). Lourdes rosary beads, the heart beads are 8 mm and the rosary measures 18 inches approx.